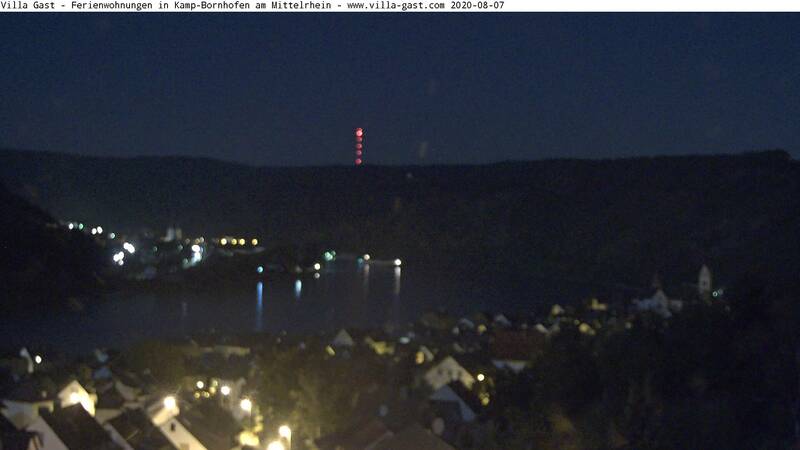 Webcam Kamp-Bornhofen: Rhine View - A nice view over the Rhine river from the Villa Gast. Boppard: Rhine View, 1.6 mi. Winningen: Koblenz Winningen Airfield EDRK, 8.2 mi. Koblenz: B9 Saarkreisel Koblenz, 9.5 mi. Koblenz: B9 Saarkreisel Koblenz, 9.6 mi. Kaub am Rhein: Benno's Truck Stop, 11.3 mi. Vallendar: HD View Rhine near Koblenz, 12 mi. This webcam Kamp-Bornhofen with the theme Rivers was added on February 18, 2015 and is operated by Villa Gast. It got 3563 visitors since then. Shouldn't this webcam work or should the link be wrong please report that here. You can add this webcam here to myCams.